Meanwhile a front-page article in The Australian said there had been a “surge in property speculation” by SMSFs using LRBAs, and that this has “sparked concerns” in the Council of Financial Regulators (CFR). The Australian pointed to documents obtained under Freedom of Information (FOI) rules. FOI documents released by Treasury, titled ‘Limited Recourse Borrowing Arrangements’, include a table of the estimated total value of LRBAs up to June 2018, with a calculation of “LRBAs as a per cent of total SMSF assets”. On 10 December 2018 the ATO released its most recent SMSF statistics, up to September 2018. 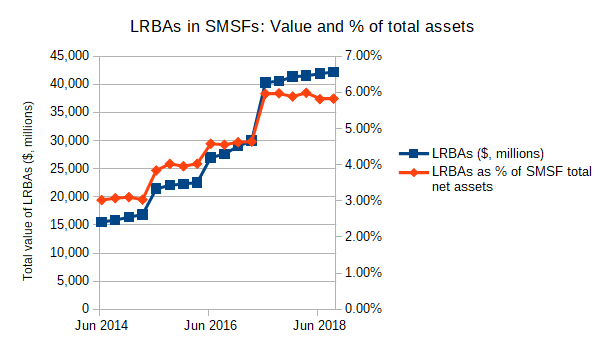 The statistics show that LRBAs have continued to grow, though there may be a trend of them declining as a percentage of total SMSF assets, down from a peak of 5.99% in March 2018 to 5.83% in September 2018. However these figures may be subject to revisions as SMSF Annual Returns are lodged – note the spikes in June each financial year. The Coalition Government’s Financial System Inquiry had recommended a return to a general prohibition on borrowing by super funds, which would mean banning LRBAs. However the Government rejected this recommendation, instead tasking the CFR and ATO to monitor leverage and risk in the super system and report back after three years – at the end of 2018. The CFR report has yet to be publicly released, if it has been finished. Members discussed a report to Government on leverage and risk in the superannuation system, as requested in the Government’s response to the Financial System Inquiry. The use of limited recourse borrowing arrangements remains relatively small, but has risen over time. Leverage by superannuation funds can increase vulnerabilities in the financial system, though near-term risks have reduced with the shift in dynamics in the housing market. While the reports of the Productivity Commission and the CFR will shape policy on LRBAs, the key factor is the upcoming Federal Election. Part of Labor’s housing policy is to adopt the recommendation of the Financial System Inquiry to ban LRBAs on a prospective basis. Shadow Treasurer Chris Bowen this week accused the Government of letting risks in the sector go unchecked. “‘No comment’ is the best the Treasurer of Australia can offer on an issue where our regulators – and the Government’s five year old financial systems review – have been voicing concern over the risks for years,” he said. Its unclear where the $32 billion figure comes from, as it is close to $10 billion under the current figure from the ATO. According to the ATO there was $42.2 billion in LRBAs as at September 2018 and $24.2 billion in ‘borrowings’. The March 2018 ATO statistical release had a figure of $32.159 billion, though this has been revised upwards to $41.552 billion. “This is a Government that has been asleep at the wheel when it comes to listening to the advice and managing risks in the economy,” said Mr Bowen.